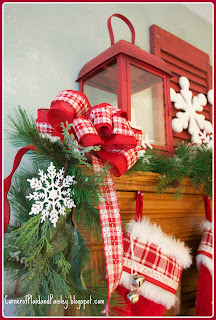 Christmas Mantel- Let it Snow! My Christmas Mantel - Let it Snow! Welcome to the start of my Christmas decorating! I have a snowflake theme going on in my family room with my mantel. It all started when my girlfriend Alicia and I were shopping in Amish Country and we stumbled upon these red shutters. They called out to us! Just like the honey graham pretzels they sell at the bulk food store! Next it was the bolt of red plaid burlap ribbon that spoke to us! 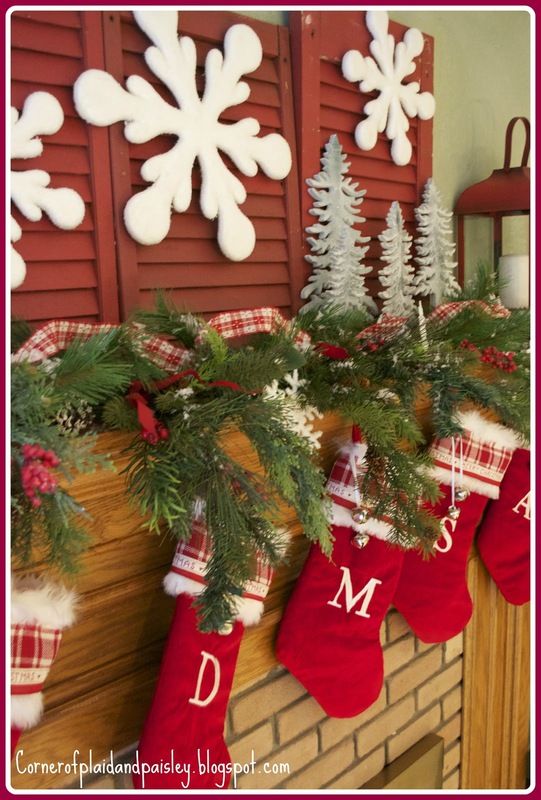 I used these giant snowflakes that I had hanging in my foyer last year as my big statement on the shutters which kind of created the theme. I decided since I had just bought new stockings last year - I had to use them again, but I wanted a little bit different look. So I used some of that plaid ribbon along with two other ribbon trims I found at Michaels. Using my sewing machine I layered the three ribbons to make a wide band for the cuffs. Then I just hand basted them onto the fur trim. This way if I want to change them out for something different next year it will not be difficult to remove this trim. All of my greenery is fake stuff. I tried to layer it with different types of needles to make it look a little more real. I tucked some in smaller snowflakes, pine cones, berries, a little ribbon and then also sprinkled everything with fake snow when I was done. and the two big red lanterns anchoring the ends are from Kohl's. Now that I have started this room with a bold red and white theme, I will go from here to decorate the rest of this room. Watch for more to come! Very pretty! 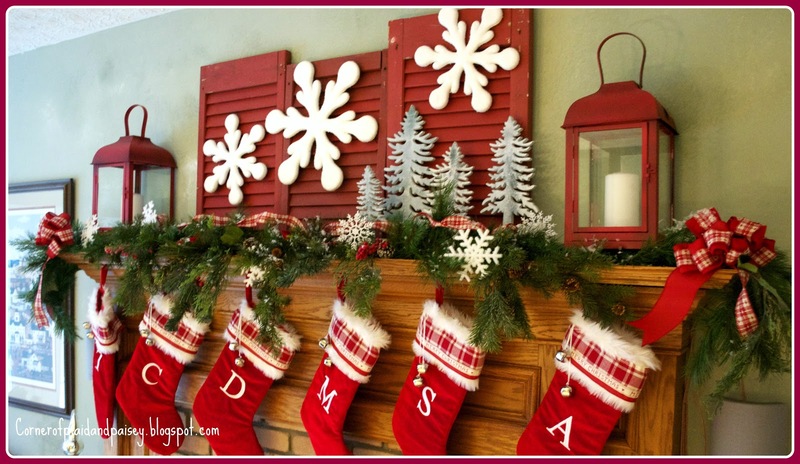 Love the red shutters! 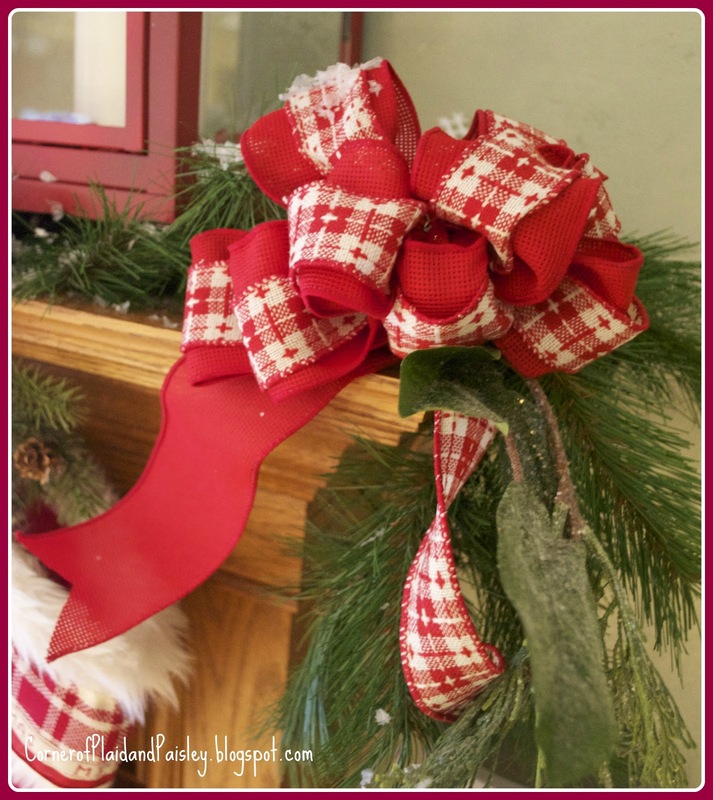 The red is beautiful and so festive. 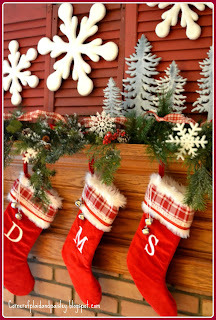 I totally love all of the stockings. 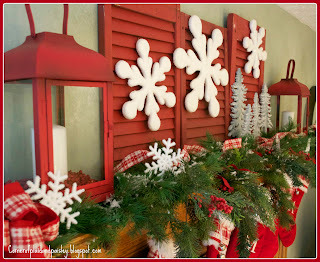 Love how you used those cute red shutters...GREAT LOOK!! I love it!! A gal after my own heart! Too cute. Love the traditional colors. Thanks for linking up. 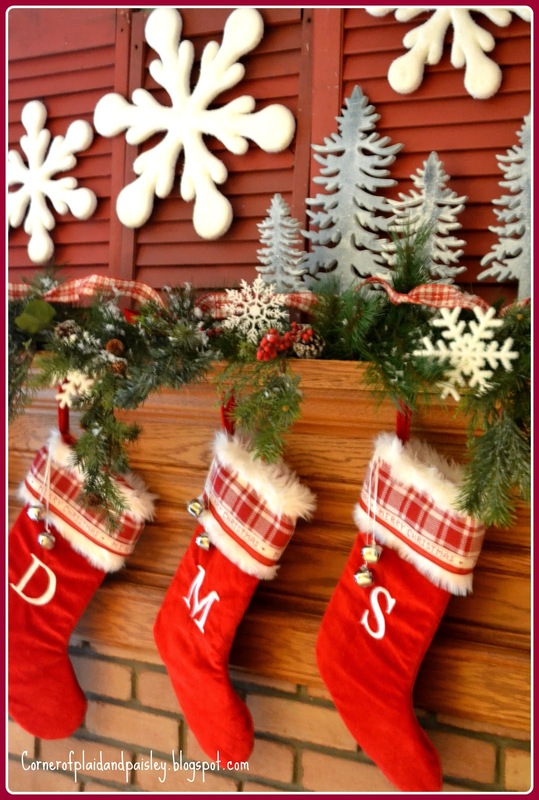 Ann - what a fabulous, festive mantel! 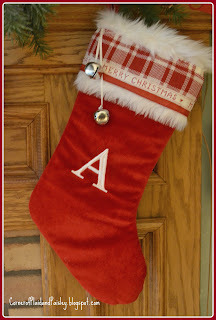 Love the monogrammed stockings! Oh thats is such a wonderful idea with the shutters. The red looks so festive with the white snowflakes!!! Love the way you tied it all together with the lanters. Lovely. I love the red shutters and the giant snowflakes! So pretty! Love it! Everything ties together perfectly. 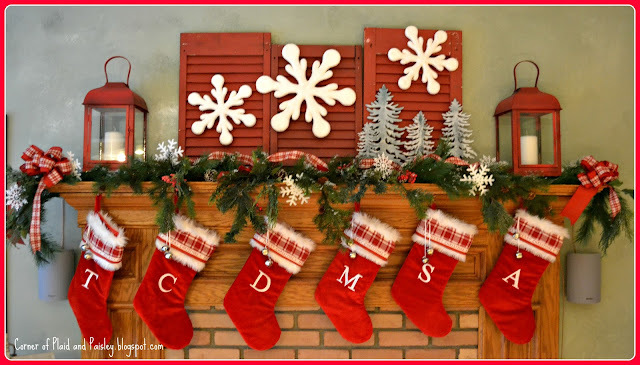 Love the trim on the stockings and the red shutters. Ann I always love to see what you do with the treasures we find on our shopping trips you never fail to do something unique and wonderful. This is one of my favorites. Nice job! Love the shutters and snowflakes - and those trees. so cute! 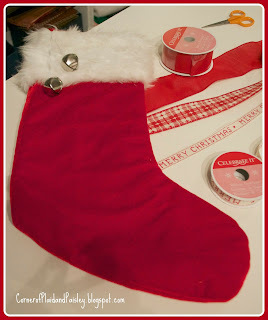 The red is so pretty and festive! "WOW! Great Article you can also Find Some Relevant.